A new play which claims that Aristotle Onassis was behind the assassination of US senator Robert Kennedy has drawn the ire of both the Onassis Foundation and myslef. Martin Sherman’s offering first appeared in Chichester in 2008 under the title “Aristo.” Would that his bio-drama had stayed there and biodegraded in the nearby English Channel. A new play which claims that Aristotle Onassis was behind the assassination of US senator Robert Kennedy has drawn the ire of the Onassis Foundation and myslef. 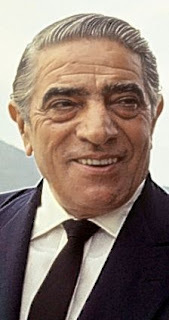 Based on a crappy book from Peter Evans’s book “Nemesis,” the play contains the allegation that in 1968 Onassis paid $1.2 million to Palestinian terrorist Mahmoud Hamshari to fund the assassination of presidential candidate Kennedy. Supposedly, he wanted to remove all opposition to his marriage to Jacqueline Kennedy. Ari did not agree with Peter Evans autobiography and his book is wrong and insulating for Ari and makes various false allegations. Since the allegation is shrouded in maybes and what-ifs, it feels curiously leaky. Once you add in gobs of back story and undigested exposition delivered straight to the audience by a pseudo Greek chorus, you have a straight-to-scrapyard wreck. Not surprising that Onassis Foundation, released a statement defending his reputation. It read: "The Onassis Foundation does not wish to comment on Mr Evans' fiction or the play based on it. It is forced to underline, however, that Mr Evans' book is not a biography, and not even written with the permission of Aristotle Onassis. From what we know, such permission has never been granted to Mr Evans. "It is not based on serious research, but on rumours flying about Aristotle Onassis. It is no coincidence that it was published many years after the death of Onassis himself and all the witnesses cited by the author. "We hope that the Greek and international press will not be exposed by reproducing uncritically as 'facts' things that affect Aristotle Onassis' memory, and only help the release of Mr Evans' book."